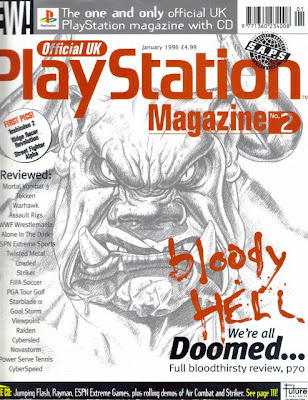 "Welcome to issue 2 of the Official UK Playstation Magazine. And don't worry if you were expecting the December issue (issue 1 was November), this is in fact issue 2 - you haven't missed one. That cleared up, I'd like to thank the thousands of right-thinking Playstation owners who saw the light and decided to buy our first issue. We've had a stack of mail from you all - competition entries, reader surveys, e-mails and letters. As a special treat (and to make up for issue 1 going on sale a bit late) we've squeezed in an extra 16 pages, not to mention a handful of exclusive previews of scorching new Playstation games. If ever you needed any proof that you'd made the right 'next generation' buying decision, flip through the pages of the issue: Doom, MK3, Warhawk, Resident Evil, Street Fighter Alpha, Assault Rigs, Ridge Racer Revolution, Toshinden 2... the list goes on and on. This much excitement really can't be good for you. "A unique gaming experience, this is one of the most playable and picturesque adventures around. Shame about that ropey texture-mapping, though." "A deceptively simple looking game with hidden depths. It makes a welcome change from racers and beat 'em ups - and the two-player game is a blast!" "A deperately flawed version of a non-too-original coin-op. After the glories of Ridge Racer and Air Combat, Namco should apologise to everyone for this sad effort." "The standard of competition deems Cyberspeed surplus to requirements. It's ill-conceived, poorly realised and ultimately a pointless excercise. Avoid." "Easy to see why Doom was one of the biggest games on the PC - compelling gameplay, with a spine-tingling atmosphere and a sense of urgency." "A triumph of design over content, ESPN initially makes you gasp but upon closer inspection, the wrinkles reveal themselves. Uneducated fun." "FIFA, while an undeniably impressive and thorough soccer sim, isn't quite the game many hoped it would be. It warms the console rather than sets it on fire." "In combining large, stylish, angular polygon graphics with a playable arcade engine, Konami has succeeded in producing an intuitive sports game. We like." "Explosive. Exasperating. Exciting. Examinating. Energetic. Enraging. It's technically brilliant, but Loaded is big games for small brains." "An exceptional game and a brilliant conversion job. This is about as good as conventional combat games get. Next step Mortal Kombat 3D?" "A brave attempt at harnessing the power of full-motion video with gameplay - which fails miserably. Please do not approach this game under any circumstances." "A fair way to describe PGA? Am emormously engaging, addictive golf game which will take days from your life. Shame about the dearth of courses, though." "You'll have to be the world's biggest tennis fan to buy this one. And blind. In two-player mode, there's limited fun to be had, but the music will finish you off." "Bloody good fun and reams of brash explosions to tease the eye. This is a perfect conversion - just don't expect graphical excellence." "Prettier than a winning lottery ticket. Slicker than snot. But easier than a leather-clad nymphomaniac in a monastery." "Doesn't offer enough in the way of continuity to earn the title of 'next generation', but despite the flaws in the gameplay, it does just about enough to entertain the gamer." "A pugilist's dream, Tekken is quite simply the finest game around. Unrivalled depth and playability. We score it nine but add more points anyway. It's the best." "As viciously competitive as any of the finest two-player games out there. Even the workman-like visuals can't mask the scorching classic lurking underneath." "A truly gorgeous shooter, currently first in a field of one. But the difficulty and frustration factor means die-hard game fans only need apply..."
"A genuinely rewarding, thrilling action experience. Very, very tough but well worth the investment in time, patience and lost sleep. Go get it." "Although visually off-putting the intense gameplay compensates for the lack of polygons. But don't expect to be playing this two months down the line." "A genuine contender on the beat 'em up circuit. Not as accomplished as MK3, but more hilariously entertaining than anyone would have expected." - An interesting piece in the Japanese column which indicates that Castlevania: Symphony of the Night was very close to being canned. "...however, using 16-bit games as a basis for 32-bit Playstation titles can be a dangerous pastime, as Konami has discovered. Dracula-X - the latest in its line of Castlevania games - has been indefinitely postponed due to a lack of graphical flair and dated gameplay. Barring a complete re-write, it may even be shelved for good." - I wonder how different Resident Evil's fortunes would have been if this turned out to be true? "Unfortunately, the European version is dispensing with the blood, though our friends in Japan will see the game in its full gory. Sorry, glory." - Parasite has to be a candidate for Worst. Plot. Ever. "Ex-cop Jack McCann is sipping beer in a bar in Blackhill City when he notices the beer has a strange taste. An extra-terrestrial has fallen into the beer and the characters are now stuck in each other's body, Jack steadily mutating into a monster." You guessed it - the game was canned. - The Doom review also has a look at Quake and Hexen. Ultimately, Quake was never released on Playstation (though Quake 2 was converted). - Viewpoint was originally released on the Neo Geo as a massive 72MB cartridge and cost a whooping £225. Yes, two-hundred and twenty five pounds.